Gareth Bainbridge and Alan Matthews. North Shields scored a hat-trick of awards at the Ebac Northern League’s annual dinner. Chairman Alan Matthews won the Arthur Clark award for his outstanding contribution to the league in 2014-15. Alan has been at the helm of the FA VAse-winning club for almost 20 years. 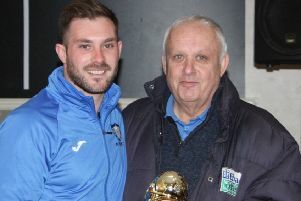 “It took quite a long time, but Alan’s perseverance and vision has built a football club of which to be proud,” said Ebac Northern League chairman Mike Amos. The Robins completed a treble when team manager Graham Fenton was named manager of the year – narrowly ahead of Carl Jarrett, who led Marske United to the league championship – and prolific striker Gareth Bainbridge was named the BBC Newcastle Player of the Year. Gareth had been the league’s player of the year last season. North Tyneside picked up two further awards. West Allotment Celtic’s programme, edited by Craig Dobson, was named programme of the year, while Whitley Bay club shop manager Doug Parker – another who does much more than the job title suggests – won highly commended in the Unsung Hero award. Friday night’s dinner marked the end of a hugely successful season for the world’s second oldest league, in which North Shields won the FA Vase at Wembley – the sixth time in seven seasons that a Northern League side has won the national competition – and Marske United won the First Division title after the most thrilling title race in memory. Striker Paul Brayson won an Ebac Northern League double – collecting the awards for Player of the Year and leading First Division goal scorer. Brayson, the Newcastle Benfield striker scored 42 league goals, plus a further seven in other competitions. He made one senior appearance for Newcastle United – a League Cup tie – had loan spells with Swansea and Cardiff before signing for Reading for £100,000. He won one England C cap, while with Northwich Victoria. Consett’s former Hartlepool United striker Michael McKay was second in the First Division scoring charts with 36, followed by Michael Chilton (Morpeth Town) and Jamie Owens (Marske United) both on 28. Channon North’s 40 goals for Hebburn Town won him the Second Division award, followed just one goal behind by Mark Davison and on 33 by Mark’s Washington team mate Chris Winn. Michael Sweet. runner-up in the Player of the Year voting, was named the league’s Young Player of the Year after hitting 28 goals for relegated Billingham Synthonia. The total included five in each of two successive games. Craig Gott, of Marske United, was third in the Player of the Year voting; Seaham Red Star’s 19-year-old midfielder Lewis Wing and Dan Halliday of Dunston UTS were second and third in the Young Player frame. Backed by a standing ovation, West Auckland secretary Allen Bayles took the Unsung Hero award after 25 years with the club. Allen has had to take a back seat because of family illness. Alnwick Town jack-of-all-trades Robert McKie was highly commended. South Shields won the Tea Hut award, sponsored by Co-op Funeral Care, despite playing all ‘home’ matches at Peterlee, 20 miles away. The Mariners return to their former home on South Tyneside in 2015-16. Heaton Stannington won the award for the league’s most hospitable club, sponsored by the Ramside Hall Hotel. Salvers for the highest average marks in the league’s highly successful Secret Shopper initiative – chiefly aimed at tackling offensive language – were presented to Hebburn Town and to Stokesley Sports Club. Keven Howe won the Silver Whistle award for the top referee ion the second division. The league also handed out substantial cash awards in the Fair Play league, ompiled on yellow and red cards. Guisborough Town took top money in the First Division and Ryton and Crawcrook Albion in the Second. Fourteen clubs shared a £5,000 prize pot after flawless administration during the season. Special presentations were made to Tony Golightly, league secretary for almost 24 years until he stood down in October, and to Canon Leo Osborn, retiring after 18 years as league chaplain. The awards were presented by Lord Pendry of Stalybridge, president of the Football Foundation, and by Ebac Ltd chairman John Elliott.